The ocean inspires from nearly every corner of The Ritz-Carlton Bal Harbour, Miami, a tranquil enclave located on the northern tip of Miami Beach. With the Atlantic Ocean on one side and the Intracoastal Waterway on the other, this coastal sanctuary provides a private and exclusive getaway. 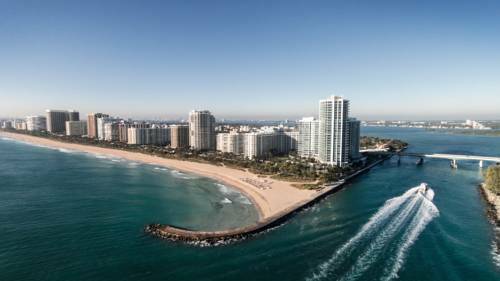 Bal Harbour offers quiet beaches, world-class luxury shopping and dining, and a vibrant art scene, just minutes from the culture and nightlife of downtown Miami and South Beach. The boutique-style 19-story, 95-room hotel offers exclusivity with just two rooms on each floor, each with a private terrace overlooking the ocean and Intracoastal Waterway, elegant and contemporary d cor and a freestanding tub surrounded by floor-to-ceiling windows. Suites are fully equipped with a gourmet kitchen. Artisan Beach House: At the intersection the Atlantic Ocean and the Intracoastal, Artisan Beach House celebrates centuries of fishing tradition by offering guests the freshest seafood, prepared using techniques from around the globe, always with fresh, seasonal produce.